Our day in Ann Arbor, MI got off to a good start with a lie-in and, for me, a swim and the treat of going back to bed to catch up with some admin. Others took the opportunity to use the gym, or go out to the mall, or make the habitual pilgrimage to Whole Foods for lunch. 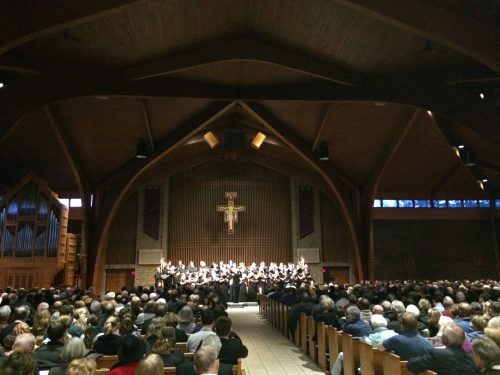 St Francis of Assisi Catholic Church was the venue for the final concert of our US tour back in October 2015, and on that occasion we only made it there with about 30 minutes to spare before the concert due to a tire blow-out on our bus on the way. 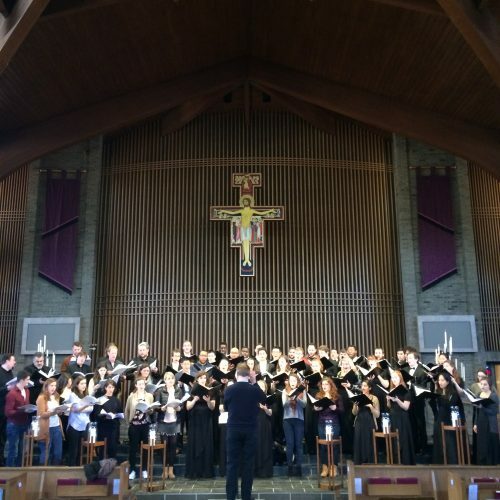 It felt like a luxury for us to arrive with plenty of time to rehearse Footsteps with the University of Michigan Chamber Choir, and then to work out how we were going to use the space for all the movement in Path of Miracles. We even finished the rehearsal 10 minutes earlier than scheduled. Starting the concert sharing the stage with the University of Michigan Chamber Choir was a real pleasure. They produced a beautiful sound and were wonderfully responsive to Nigel’s directions. They are clearly in very good hands with Jerry Blackstone. The acoustic was one of the clearest we’ve sung in this tour, although still with a lovely bloom. I always find the opening of Path of Miracles a really thrilling experience, standing at the back of the church waiting and listening as the men build the tension more and more before finally launching all the way up to the tenors singing a top B. Somehow the harmonics and overtones they created in that space were especially awesome. The real hero of the hour though was Fiona, who had food poisoning set on just as the concert started and had to dash to the bathroom before we sang Path of Miracles, but managed to keep it together for the whole thing. After the concert, we returned to another old haunt, the sports bar near our hotel. Maybe it was the sporting theme that inspired them, but the tenor section decided it was time to show off their skills, with Nick leading the charge demonstrating his ballet moves. Not to be outdone, Jeremy decided to exhibit his throwing with a spicy chicken wing missile aimed in my direction. The only correct response seemed to be an attempted head brace, which he quite literally shrugged off, lifting me clear off the floor with the strength of his neck. Maybe that’s the secret behind all those top Cs. We do seem to find some bizarre ways to let our hair down post-gig, but that’s an essential part of touring and keeping spirits up.